A lot of famous teas come from the region in China called The Golden Triangle, which was the source of many Imperial Tribute Teas or in modern days called “famous teas”. Tribute Teas were chosen by the Emperor of the last four dynasties for remarkable taste and qualities. The teas were exclusively available only for royal tastes and sometimes even were used as tax payment. If any of the Tribute teas that did not satisfy the royal taste, they would be given to court officials, who could drink the tea or sell it illegally for profit. In Chinese, “Mao” means fluffy, and “Feng” means mountain peaks. 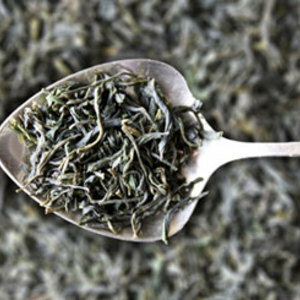 Our organic Mao Feng grows in the mountains of central Zhejiang province and is harvested only in early spring from leaves picked at the right moment and carefully processed. The highest grades use only one bud and the first leaf. Each day the leaves will be different, and they produce a slightly different batch of tea. The leaf has a pleasantly sweet, mildly fragrant aroma, with a hint of apricot. The brew in the cup usually infuses to a very pale yellow with a hint of green. The taste is mellow and sweet with a nice hint of subtle grassiness. Mao Feng Tea drinkers say that the first brewing is fragrant, the second brewing is sweet, and the third brewing is strong. The tea tastes clean and refreshing, and lasts a long time on the tongue. Like a great wine, it also has to be a good year. First I want to say HAPPY ST PATRICK’S DAY from the SororiTEA Sisters! You know SororiTEA Sisters find ANY reason to drink…TEA, that is…so St. Patrick’s Day is yet ANOTHER reason to “drink up”! My posts today will feature GREEN Teas. My first post for today is Mao Feng Green Tea from TeaVert! I really enjoyed this tea! It’s a mellow-sweet, slightly buttery yet vegetable-esque and subtle grassiness type taste all wrapped-up into one with a grassy/dried apricot aftertaste. In short, it’s a darn good Green! I’m VERY impressed with TeaVert’s Selection and am looking forward to sampling and reviewing more of their teas! A brightly-coloured infusion, with jade green undertones, this exotic blend balances the sweetness of quince with a delicate base of Japanese green tea. Green tea is prized for its antioxidant constituency and subsequent benefits to health (particularly digestion). 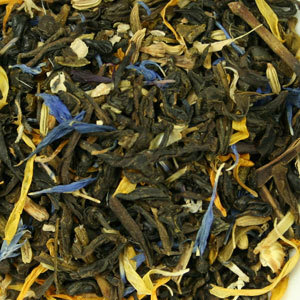 The result is a rejuvenating, aromatic and refreshingly palatable tea that can be enjoyed any time of the day. I can’t say as I have had too many or any Quince flavored teas YET but after tasting this one from Byron Bay Tea Company I surely want to try more! 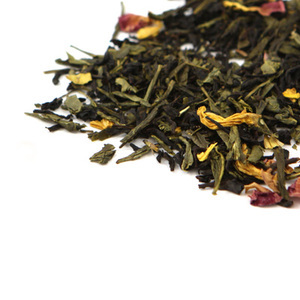 The sweet green tea taste is delightful – the quince was MADE for this tea and it’s juicy but not tart in the slightest – and the Jasmine isn’t over the top or even that strong at all but gives it an overall ‘pretty’ factor that completes the cup. The Quince is the key and it is good! Overall, it’s a gentle, fruity, sweet, yet pretty flavored green but I like this! I really like this! This Matcha is specially blended for a Matcha Latte. 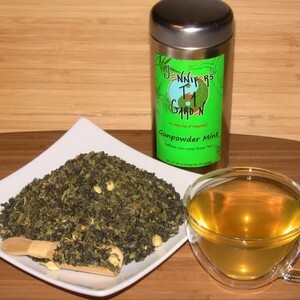 This blend provides a smooth rich texture and deep green tea flavor to make a full bodied Latte, just add milk. This blend dissolves quicker than any of our other products for instant use. Can be used both steaming hot and iced. 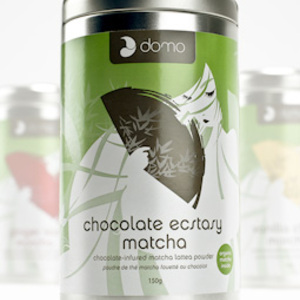 Our Premium Latte Matcha is made with a higher grade of gyokuro leaves. This yields a finer texture and more delicate flavor. The aroma is sweeter and the flavor is less bitter than our standard matcha. Both are a delight to drink they just have a slightly different flavor profile. 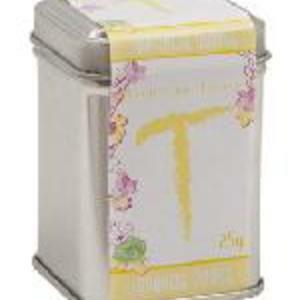 This tea is made from Gyokuro grown exclusively in the Shizuoka region of Japan. There are no preservatives or additives of any kind. Imported directly from Japan to preserve peak freshness. Let me start this review off my saying…I’m a rebel child. I have a hard time following instructions. Especially with my teas! I like to do what I call a DOUBLE SHOT – twice the amount for the same amount of time. I was really tempted to with this but forced myself into following the instructions the first time I tried Teanobi’s Latte Matcha! Therefore…I did 1 cup of hot milk with 1/4 tsp of this latte powder. It had a very pale aroma before adding to the milk and afterwards as well. I will say that the milk/powder color is beautiful! It reminds me of a “Grasshopper”. You know like the frozen-adult beverage type. This powder paired with the milk froths up very nice without much work at all! All I had to do was stir! There were a few small clumps which was more my measuring cups fault than this lovely powder and it was fairly easy to take care of with a few more stirs! No Problem! This is VERY frothy and milky-smooth! It’s creamy, too! I noticed as it cools for a little bit at room temperature the flavor was enhanced slightly. I could taste more of the ‘green tea’ come thru. The green veggie type green tea that is…much like broccoli and along with the milk it sort of reminded me of cream of broccoli soup! It’s quite FAB! I wanted to try this with Almond Milk but I didn’t have any. I used regular milk. I am also going to try this without milk and try it with water instead just to see the difference! And because I am a Rebel Child…will probably try a DOUBLE SHOT just for kicks! 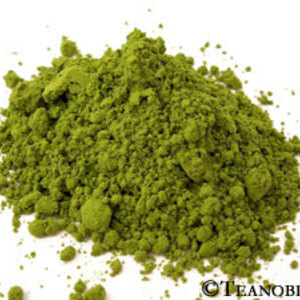 I think this is a very good matcha powder product – I love that it was created with Latte’s in mind! This is very nice! And another winner from Teanobi!